These were the original “Children of the Empty Promise” that were six years old in 1964 when I began The State of the Nation 1966. The promises that LBJ made to our children of “The Great Society” were broken long before those ‘Empty Promises’ were made to all of us, 61 years ago. 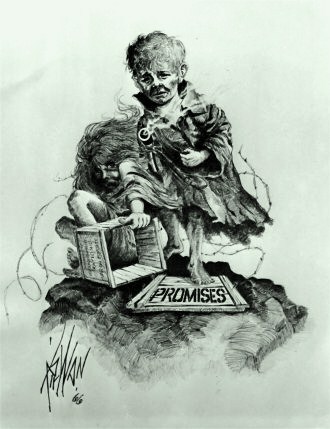 When this lie was constructed to supposedly create a future for everyone, way back then: Most people believed that those “PROMISES” would be kept and not disgraced, because “The Great Society” was supposedly about the future for all mankind. We are the living proof of all the lies that sprang from everything that we allowed the Outlaws to do to the world, as well as to everyone here. The other basic lie upon which everything the Great Society promised to America was this massive “FREE GIFT” of literally everything that anyone could want, or need, to ensure the lives of everyone alive in 1966. 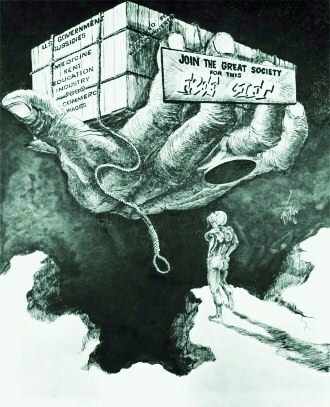 The sign reads: “Join the Great Society for this Free Gift”. The nation fell into line, while the government proceeded to break every promise they ever made to both the nation and the world. This nation, from that moment on, was conned into failing to ever look back at the millions of crimes which continued for that entire period of time during which we had the life-blood of the nation stolen from us, along with everything else that makes human-life possible. Those Children of the Empty Promise are now in their fifties and they still have yet to see any of the promises that were made to them when they had nothing at all. But, this was never about ‘the promises’ themselves. It was always about how much more could be stolen from all of us, in the guise of fake-policies, before enough of us woke up and began to demand an end to the continuing global-crimes. The time has come to smash this obscene road-show and demand an end to all the false-flags, all the treason and the global-nightmares that we have allowed to cover the entire planet. No one can ever totally-protect anyone else from whatever might happen to us in the course of our lives: To yearn for “Absolute Security” is beyond reason, yet that’s apparently what government thought they could promise us, while they completely stripped the society and the world from any protections at all by simply spying on every person on earth, 24-7 forever. The final chapter of all these wars and the unilaterally declared variations on martial-law which are being written now in the travesty that continues in Ukraine, over all the continuing political cancers we allowed to flourish from the mid-sixties until the present time. When we look at what just happened in Paris, it is impossible to miss the fact that for the last twenty years the world has been living according to the Politically Correct Lies of the corruption’s that started all this in Germany in 1932. Multi-culturalism in tandem with supposed total control over the thoughts and actions of every person on the earth is NOT working. That is why the CENSORSHIP at every turn coupled with the shut-down of the right of any person to treated with reason, has failed. When enough individuals are sufficiently wronged, publicly, there will be reactions to those illegal societal strictures. Because of the huge discrepancies which were created by the millions upon millions of people that became homeless, under the polices of the New World Order, which provided nowhere to go and no way to survive their tactics: While they manipulated and then stole nation after nation. The entire world now has an immigration problem that has morphed into a societal problem for every nation that participated in the taking of lands and property which was never theirs. 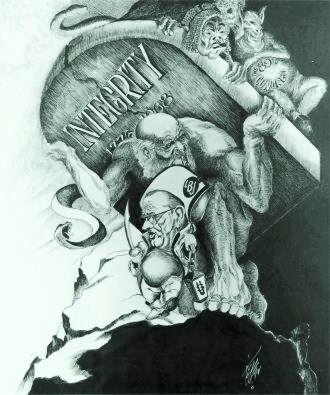 The spinoffs of the crimes that were never punished, under the currently failing efforts to convert the entire planet into a unipolar world, “had many fathers” and every nation that played that game is now going to have to fight for their individual lives, because the world accepted the concept of an entire world without laws of any kind ­ except the laws which prohibited any of the slaves from revolting or from being able to keep what had been theirs. Now the entire rotten edifice is about to come crashing down—because it was never strong enough in the first place to dominate the planet. Now, every corrupted regime will soon be facing the same set of nightmares that France is undergoing right now. In some nations it will be religious, in others it will be societal, and in still others it will be nationally directed: But the massive dissatisfaction has spread to everywhere and “like-it or not” rebellions of all types will be coming to every place that has electricity or the internet. There’s a very ugly common denominator for all of this: The totally corrupt mass media, that’s been lying to the global public since the political beginnings of LBJ. Their licenses to publish should be pulled for the blatant lies they continue to spew. The New York Times, the Washington Post and the Wall Street Journal need to be closed for starters because they’re not publishing news: They’re psy-ops political organs, paid for by the criminals that are running what’s left of the USI, which has become public knowledge among those who are not brain-dead yet. The chaos that is Ukraine today, because of all the political lies being pushed by Washington, London and the Vatican today, have sought to justify a massive and unjustified war in Ukraine where just a year ago there was no war at all. Much is made, by the criminal-rags in America, England and in the West in general, about the Russian invasion of Crimea. Ironically no one ever mentions that there were NO CASUALITIES, in that supposedly hostile invasion. What kind of an invasion or indeed any kind of any war has ever happened without any causalities at all? There are dozens of parts of the Ukraine story that are not discussed but the Cross Talk article is at least a beginning. What the planet needs, perhaps most of all is a global trial of what claims to be mass media since it has been their continuing lies that are directly responsible for all the deaths in Afghanistan, Gaza, Palestine, Libya, Syria, Iraq and everywhere where the false-flag wars are either being courted or have been carried out? Everything that has been done by USI & Israel was created, sponsored and backed by the criminal elements of the Mass Media, pretending to be honest brokers, when it is always they who have written the fake justifications for all these global wars from Afghanistan and 911 all the way to now.